We do not put any restrictions on the posts except that they should address within their topic some of the larger questions around the role of the university. We are open for posts in Norwegian, but prefer English if possible to cater for our international students and employees as well as connecting with networks internationally. In our first Open Post, sociology professor Aksel Tjora warns against the “MacDonaldification” of higher education and research in Norway. He argues that we need to act now with a strong countercurrent collective effort, across academics and students. In an Open Post, NUN member and PhD candidate Silje Aurora Andresen shortly reflects on what the responsibility of an academic is, should, and can be. In her opinion one of the greatest responsibilities is to share knowledge – to make it available. 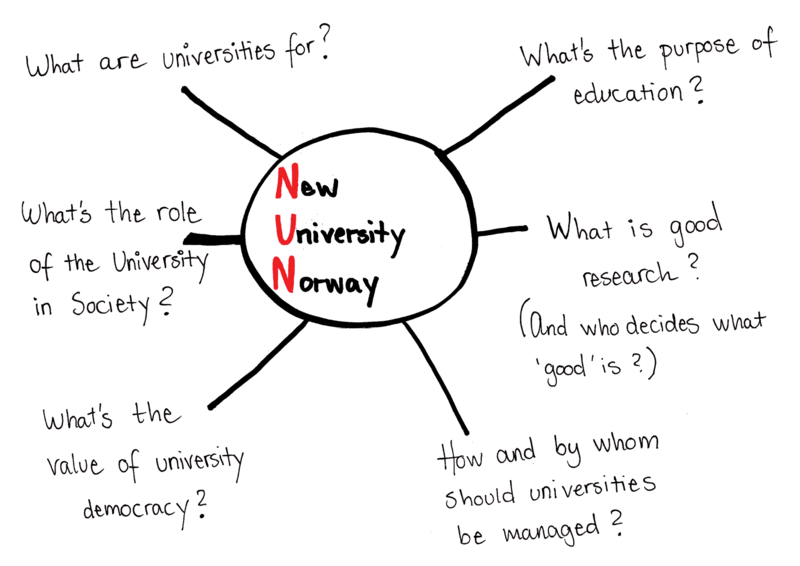 In this Open Post, professors Einar N. Strømmen and Tor G. Syvertsen from the Department of Structural Engineering at NTNU discuss the diminishing status of independent and honest science and learning at our universities. They advocate for what they term a Pβ-Academy and outline some radical principles for change. In this Open Post, Dr. Peter Gray promotes a greater focus on Responsible Research and Innovation (RRI) within the EU research funding framework.